When physical setbacks occur, Rehabilitation Services at Cooley Dickinson Health Care can help you advance toward your optimal strength and mobility. Services include Physical Therapy, Occupational Therapy, and Speech and Language Pathology. We provide inpatient and emergency care 365 days a year, and outpatient care at six offsite facilities. 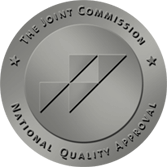 We provide care to patients at the hospital and at satellite rehab facilities; and we also provide treatment for people diagnosed with lymphedema at the Mass General Cancer Center at Cooley Dickinson. We’re dedicated to helping you move forward, step by step. Our rehab facilities and providers reach deep and wide into the Pioneer Valley community of Western Massachusetts, employing licensed physical / occupational and speech therapists, assistants and athletic trainers and performing close to a quarter million treatments per year. In addition, we provide athletic training services including injury prevention, practice and game coverage and treatment of athletic injuries to Northampton High School and Smith-Vocational High School athletes. 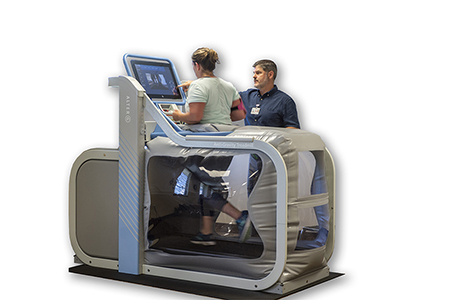 Cooley Dickinson Rehabilitation Services employs some of the most cutting-edge equipment in the field, including the remarkable Antigravity Treadmill. Utilizing the antigravity treadmill, patients recovering from injuries, surgical procedures or neurological conditions/events are essentially able to speed up their rehabilitation process by rebuilding strength and mobility while reducing the sometimes harmful impact of their own body weight. Happy Frates-Montague rehabs at 20% of her actual body weight on the “antigravity treadmill” with physical therapist Stephen Markey. Happy Frates-Montague, Perioperative Services business manager, completed her first 10K when she was just 7 years old and has been running on and off for more than 25 years. Happy started running with her father, Peter; it was something they enjoyed doing together. “My dad trained with me quite a bit,” said Happy, who grew up in Westport, a coastal town in Southeastern Massachusetts. “He also inspired and encouraged me daily.” So last winter when Happy decided to train for a half marathon near her home town, she was excited at the thought of completing a longer distance race. “Yet despite months of training and finishing the half marathon, I injured myself,” Happy said, who described the injury as a strain to her lower back. The pain that radiated down her back into her hip and knee “impacted everything in her life, including sleep.” Happy’s doctor referred her to Cooley Dickinson Rehab Services for physical therapy. Happy is among the first of several patients who has started regaining strength and mobility on Rehab Services’ newest piece of equipment, the antigravity treadmill. He says the treadmill can be beneficial for patients who have orthopedic and musculoskeletal injuries, post-surgical patients, athletes recovering from injuries, deconditioned patients with chronic conditions, and for those athletes that want to increase their training volumes while decreasing stress to their bodies. These benefits are real for Happy, who says the antigravity treadmill gave her the ability to run without pain. “Steve was able to closely evaluate my running form and helped me to make very specific adjustments to my foot strike and gait. The weightlessness of the treadmill and the stability it offered allowed me to practice those adjustments without fear of falling or re-injury. “My ultimate goal is to return to running, and this treadmill has been an incredible tool” in my recovery. Happy adds, “I honestly don’t know if I would have had the courage to return to running, and certainly not this quickly if I had not had the opportunity to use the antigravity treadmill. When asked about her next race, Happy says she will be participating in the Downtown 5K in Providence (Rhode Island) in mid-September.